Time Groups and Time Conditions allow different call treatments to be presented on inbound routes depending on the day and time of the day. One time condition can cascade to another time condition, thereby allowing holiday schedules and greetings to be built on top of regular business hour schedules. 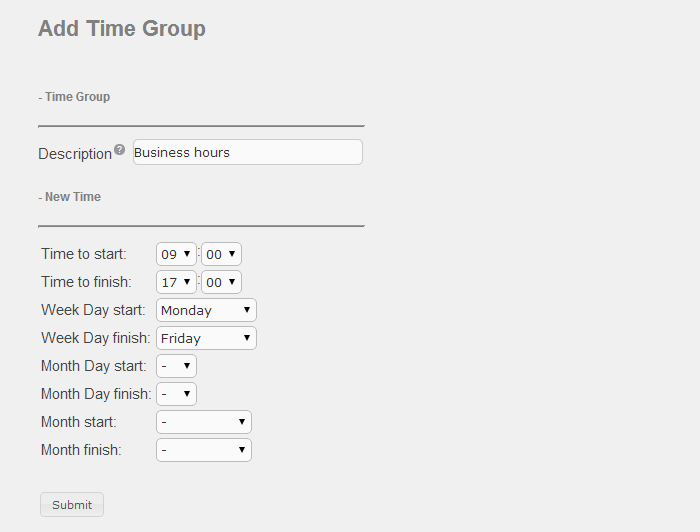 Time Group where day and time schedules are defined. 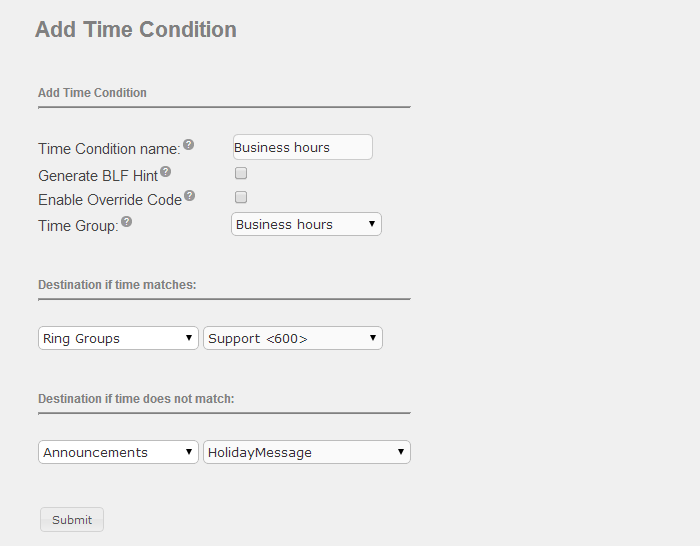 Time Condition where call treatment is specified based on whether the date and time matches the associated Time Group. Inbound Route where the destination is set to the Time Condition previously created. In order to add holidays to your schedule, we have to cascade two Time Groups in order to complete that configuration. In the example below we will enter 2 holiday dates (December 25-26 and January 1). You can enter as many days as required under the same Time Group. Set the Destination if time matches to your desired destination during the holidays. The schedule will now handle holidays, business and non-business hours. For ongoing maintenance, the holiday time group just needs to be updated once a year with the actual holiday dates for that year. Create a special holiday greeting recording, see System Recordings for details. Create an announcement and associate it with the holiday greeting recorded in the previous step. See System Recordings for details on creating a recording. Create a system recording for your holiday greeting, e.g. HolidayGreeting. Under Destination after playback, set the call treatment to Voicemail and select the desired voicemail box extension with no-msg so it does not play the mailbox greeting and plays the specified holiday greeting instead. You can capture all holidays for the year in the same Time Group and only change the announcement and recording as each holiday approaches. Using the basic elements shown in this section, you can mix and match any of the elements to suit your business needs. Make sure your UCx time is set correctly to obtain proper behaviour of the Time Group/Time Condition call treatment schedules. Please see Date and Time for details.